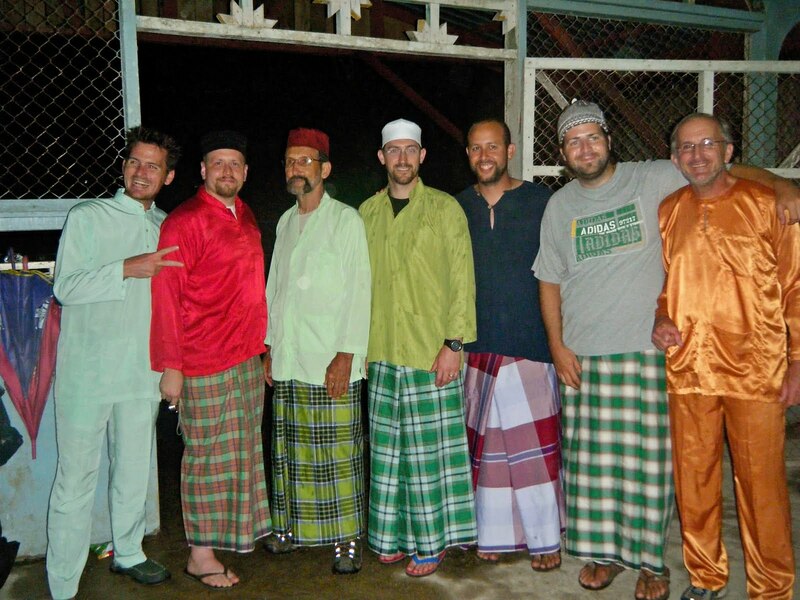 Near dinner time, Samsudin brought Sarongs to to Don and I, telling us we were to dress up for the night’s party. He showed us how to properly wrap the Sarong, which ends up looking like a long tight fitting dress. He then pulled out two green shirts, they have names for them but I can’t remember what it is. We topped off our outfits with traditional hats, which resemble a tight fitting bowl on the head. When we arrived in the village, our entire group was there, all dressed in traditional garb. 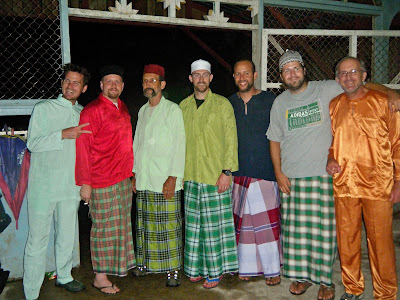 It is impressive that the Home Stay families (each of us stayed with different families while in Sukau) organized getting all of us large Americans dressed up for the party. Each house “Mom” brought a dish for a huge buffet potluck and I tasted many wonderful dishes. Ahbam (our liaison with the home stay families) gave many thanks over the loud speaker, we ate, and they had a few young people give martial arts demonstrations. A group of women played traditional instruments; pieces of wood stacked on pieces of wood, Lincoln log style, and hit with pieces of wood, very much like a mandolin. They also played gong type instruments, each a little smaller or larger than the next to produce a different sound. I cannot describe the music because it was unlike anything I’ve ever heard. Young kids teach us how to dance! ...at this point I lost this journal, in a later post you will see how we were able to track it down in from our next camp in the middle of nowhere!